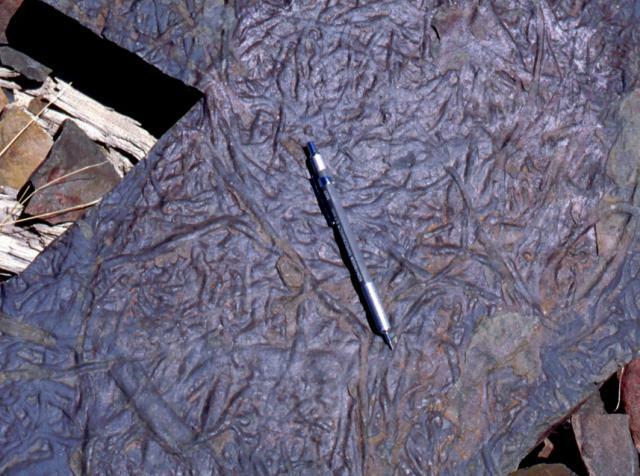 The type section for the Cambrian-Precambrian boundary is at Fortune Head, Burin Peninsula, Newfoundland, as is marked by the first appearance of the trace fossil Treptichnus pedum (the trace fossil formally known as Phycoides pedum). Treptichnus pedum is a distinctive burrow pattern comprised of a series of lobes set along a central, sometimes curved burrow, thought to represent successive probes into the sediment searching for food. 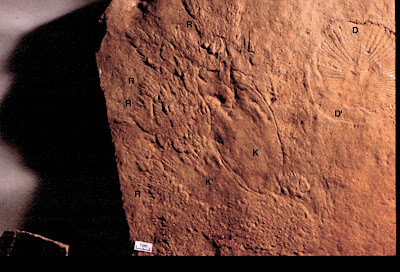 The traces are thought to represent an organism more complex that those of the Ediacaran, but that is not necessarily true, as no actual animal has been found is association with the burrows, so we don't know what made them (although modern priapulid worms make similar burrows). However, we should not confuse the somewhat complicated pattern of Treptichnus pedum with the first occurrence of well-developed, fairly complex metazoan animals. 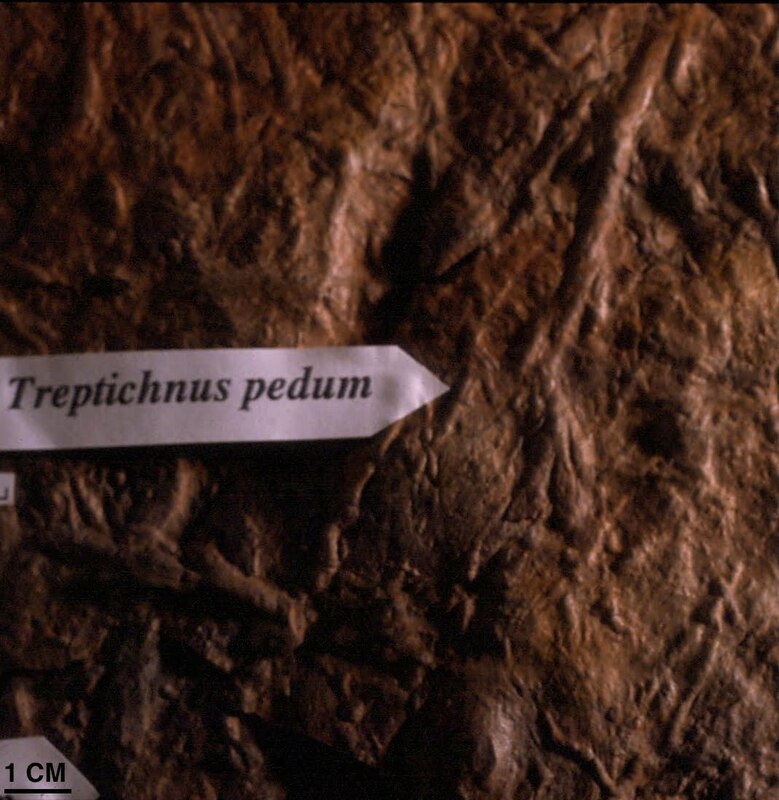 While the start of the Cambrian is marked by the first appearance of Treptichnus pedum, this is not the first appearance of trace fossils probably from metazoans. A number of trace fossil types exist in the preceding Ediacaran rocks. In fact they show a neat line in increasing complexity from simple traces early in the Ediacaran to traces as complex as T. pedum towards the end of the Ediacaran. Helminthopsis are much more meandering burrows that appear to represent shallow feeding burrows. the distinctive whorls and loops are considered to represent a different feeding strategy to that of Planolites. Towards the top of the Ediacaran, things get a bit more complex. As well as Planolites and Helminthopsis, we get the feeding traces of Kimberella. Here, the feeding traces are marked "R" for radula, and the animal itself is marked "K". A Dickinsonia is also present. 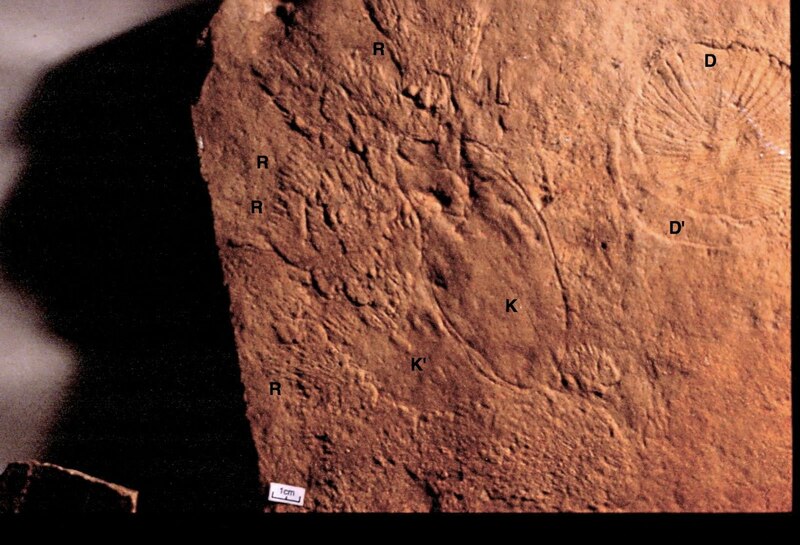 "K'" and "D'" mark the resting trace of Kimberella and Dickinsonia, which comprise, of course, another form of trace fossil. Towards the top of the Ediacaran, things start to get crowded. Not only do we have all the previous traces, but they are joined by Mattaia miettensis. This specimen comes from the Kessyusa Formation, from Khorbusuonka in northern Siberia. The trace is filled with two bands of sediment, raised on the sides and depressed in the middle, where the bands are separated by a vertical fissure filled with clay. A possible culprit is a pripulid worm such as the Burgess Shale form Louisella pedunculata. So by the time you get to the Cambrian-Precambrian boundary there were quite a few traces around. Sure in the Cambrian the traces get much more diverse, but they don't start at the boundary, there is a steady increase in trace fossils through the Ediacaran. Aleksey Nagovitsyn has kindly informed me that the age range for Mattaia miettensis in Palaoeporn 22 is incorrect, and Mattaia miettensis is actually to be found in the Cambrian Tommotian Stage of the Cambrian. So we need to remove Mattaia miettensis from the list of trace fossils found at the top of the Ediacaran. Love the lazy loops in that Helminthopsis trace fossil. Looks like it was just our for a pleasure cruise one day in food-particle-infested sediments . . .
With action details like that, it's much easier for me to imagine a real organism making it at a real point in time, millions of years before dinosaurs, clover, and platypuses. I feel I can almost see it (whatever "it" was) slowly crawling around in circles. And somehow I feel it much more strongly for that fossil than for other fossil burrows. Dzik could not collect and has not collected all variety of trace fossils and not ascertained the cases of their first occurrence in the studied deposits during single visit on Khorbusuonka River. He has incorrectly defined age of the studied deposits on base of the first case of occurrence of Treptichnus traces in the studied outcrop which has been known to he. The deposits on the Mattaia Creek where Dzik has collected trace fossils are Tommotian age rather than of boundary Ediacaran-Cambrian or lowermost Cambrian. That is known for a long time and it is confirmed by new detailed long-term (2006-2010) researches of this Ediacaran-Cambrian deposits. Are there complex traces in the Ediacaran (in volum ICS)? Yes! 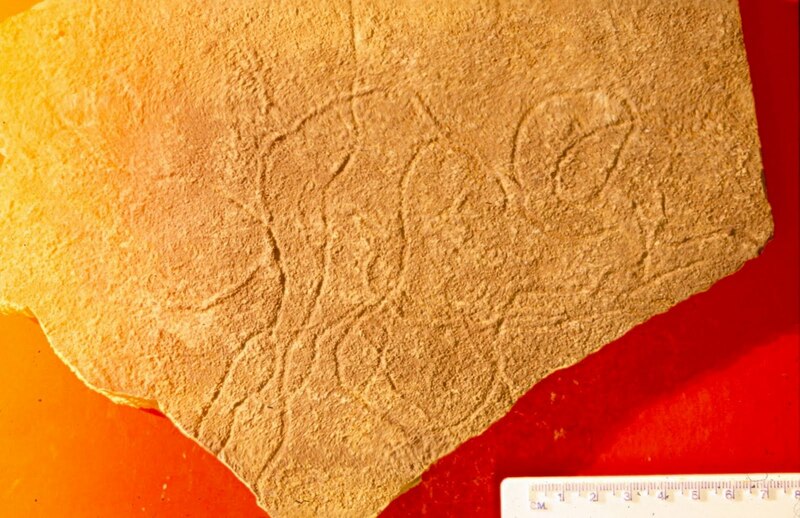 For example, horizontal sinusoidal (probably horizontal spiral) Cochlichnus-like trace and Treptichnus-like (possible Podolodes) trace from Namibia, dated between 548-545 mya. Streptichnus narbonnei from uppermost Ediacaran Namibia (around 543 mya) this system of spiral burrows more complex than the Treptichnus trace. 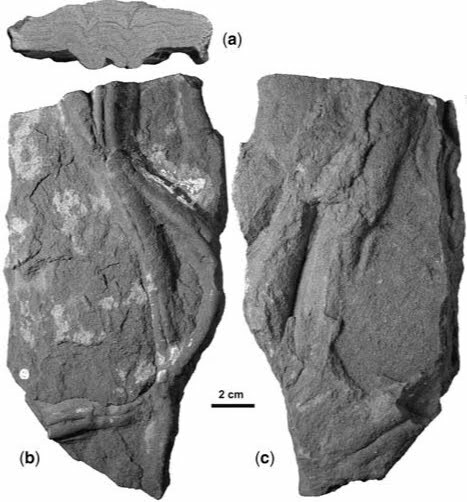 Are there complex traces in more old Ediacaran deposits, dated around 558-555 mya? Yes! The deep (1-5 см and more in depth) horizontal spiral burrow, moving over to more large vertical spiral, herewith this trace saves its horizontal spiral form. This trace formed by sediment missed through bowel in process of the moving the organism through sediment. These burrows were recently found in the Ediacaran beds of the White Sea area, Russia. Do you know if they have been published yet? I would be interested in reading about these. The Phyllozoon specimen is from the Flinders Ranges of South Australia — not Canada.